Lib Tech's "Boxes for Days - a ridiculously fun event involving a lot of boxes!" is coming back for it's second stop in Japan! 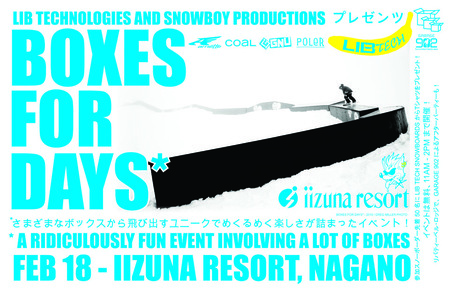 This year at Iizuna Resort in Nagano! The events simple concept is to take normal park boxes and arrange them one after another to create an abnormal, tremendously difficult, yet ridiculously fun to ride Super-Box. "It's just like Voltron...except there aren't any robots!" says event creator, Lib Tech events guy and Snowboy Productions Head Honcho Krush Kulesza. “It’s never the same event twice…it’s gonna be bananas!” says Mervin’s Pete Saari. Speaking of bananas…each stop will award one deserving shred the official Slippery Banana award for box riding prowess along with a ton of great prizes given out in RANDOM DISPLAYS OF RADNESS from our great sponsors, including Lib Tech, COAL, Arnette, Poler Stuff and Garage 902! Rumors abound of which Think Thank pros will be on-hand for the event...stay tuned to find out! Maybe even a Ransack Rebellion screening with Jesse Burtner and Sean Genovese? Hmmmmm. This event is open to snowboarders of all ages and it's BEYOND FREE…meaning that there no entry fee and the first 50 entrants get a free shirt from Lib Tech! Extra thanks to Kenji Kato, Takashi Kosugi, Kenken and the Hakuba Heartbreaker from Garage 902, Mike Miyazawa, Yuki and the crew at Advance Marketing. This is going to be a great event...we have Think Thank pro riders Jesse Burtner (LIb Tech, Bent Metal), Sean Genovese (Dinosaurs Will Die, Bent Metal), Sean Black (Arbor) and Chris Beresford (K2 Snowboarding, Thirty-Two) confirmed for the event...come hang out with us and go BANANAS!